When Otzi the Iceman was first discovered in 1991, his body was so well-preserved that, even though he’d been dead some 5,300 years, you could’ve mistaken him for someone who’d died the day before. His corpse provided unprecedented insight into what life was like in 3300 B.C. and how it differed from modern times. 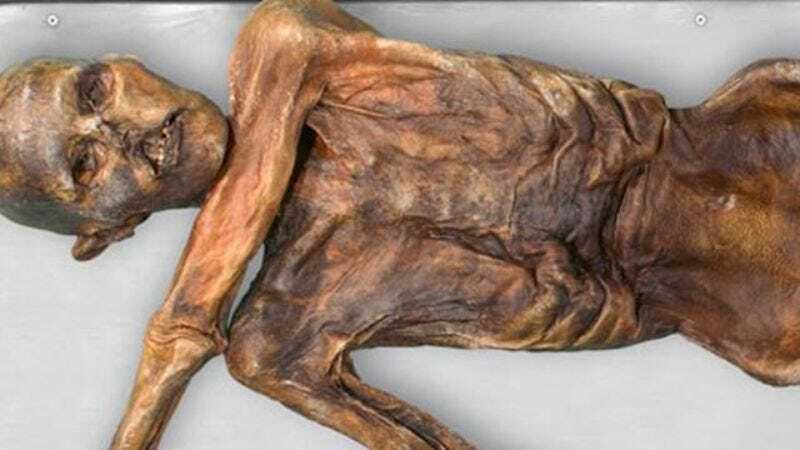 And while his frozen body left us with just as many questions as it did answers, one thing is for certain: If Otzi the Iceman were alive today, you can bet that he would definitely vote Democrat. Sure, we can’t say with certainty how Otzi would’ve voted in this year’s midterm elections, but to me, it’s clear he would’ve voted a straight Democratic ticket. Conservatives will deny it tooth and nail, but the indisputable fact—as determined by his garments and the variety of tools on his person—is that Otzi was a pastoralist, which was pretty damn progressive for someone living in a largely hunter-gatherer economy. Unlike his contemporaries, he saw a future in domesticated animals, proving that he was the Chalcolithic equivalent of a green energy warrior defying Big Oil. …Otzi was a pastoralist, which was pretty damn progressive for someone living in a largely hunter-gatherer economy. And what about his personal values? Sure, wingnuts on the right could label Otzi as a champion of traditional Judeo-Christian values, but virtually all the information we have points to him being a thoroughly devout cultist who expressed his faith by ritually burning small animals and burying metal objects underground to consecrate them to the gods. Sorry, but the fact is, if Otzi were living and breathing today, there’s just no way he’d throw his support behind prayer in public schools. Still not convinced? Well, the fact is Otzi died alone and forsaken, stranded on a mountainside in desperate need of medical attention; we can only assume that he had inadequate access to health care and would’ve been a fervent advocate for some form of universal coverage. You can also infer that he would be staunchly opposed to the military-industrial complex, considering that he was likely killed by a group of men with more powerful weapons. Conservatives can try to dispute these claims all they want, but with the facts literally frozen in time, the truth couldn’t be more plainly evident. No matter how you look at it, there’s no question that, had Otzi been born a few millennia later, he would’ve been a card-carrying Democrat.